Aspiring brewers Andy Kiehl and Rob Enzweiler have been brewing together for over 4 years. 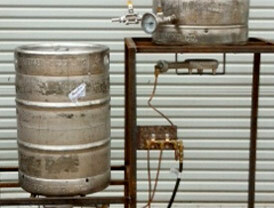 They started brewing 5-gallon extract batches using a single Sanke keg and a typical turkey fryer burner. 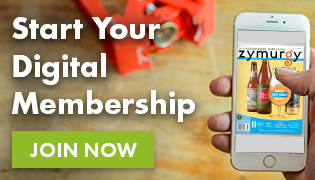 A little over a year later, they moved to a gravity fed 5-gallon all-grain system and eventually upgraded their equipment for 10-gallon batches. 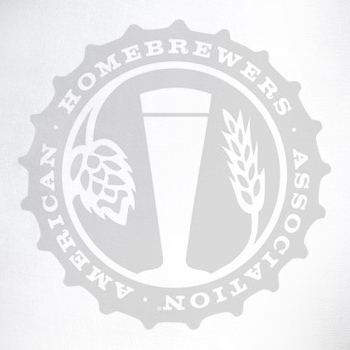 After growing tired of the lack of consistency/ability to replicate their favorite brews and having to setup and tear down their “hillybilly” brew system, they decided to build a single-tier automated system, with the majority of funding provided by fantasy sports winnings (Nothing like a hobby supporting another hobby). Andy and Rob designed their system after Lonnie McAllister’s Brutus 10 system. The frame is made of 1/8″ square (2″) 304 stainless steel tubing. Many thanks go to Greg Miller (Andy’s father-in-law) for cutting, welding and lending his imagination to the brew system. The single-tier, temperature controlled, brew system utilizes three high-pressure Banjo burners as well as three converted kegs (2 Sanke, 1 European). Two March pumps allow easy transfer of liquid from keggle to keggle via MoreBeer’s threaded stainless steel quick-disconnects (H503). Thermowells from Brewer’s Hardware are employed in the mash tun (adjustable) and the hot liquor tank (fixed length). The temperature probes from two of the Love controllers are inserted in the thermowells to automate and control the temperature in these two vessels. The control panel has the 5 Thumbs logo etched in face by a water-jet cutter. Currently, the three Love temperature controllers are turned-on by flipping the switch closest to each of the controllers. The right most switch of each Love controller activates the STC solenoid valve. The STC solenoid valve turns on and off the Banjo burner via a standing pilot light to control the temperature in the mash tun and hot liquor tank. The third STC solenoid valve (boil keggle) was added for an extra layer of safety (e.g., boil over) and possible future modification. The third Love controller will be used with a “movable” temperature monitoring system, which is detailed below. The three switches on the bottom row of the control panel trigger the main power (red cover) and the two March pumps. 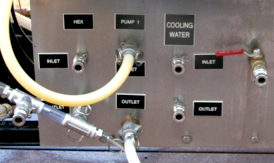 •	A third “movable” temperature monitoring system – a fixed thermowell installed into a t-fitting that can be easily moved to monitor the temperature output on any of the three kegs as well as the Therminator (similar to Lonnie McAllister’s design).